Marks/Label: Handwritten on reverse: Telfer Crowe Fire BW 28 July 1941. 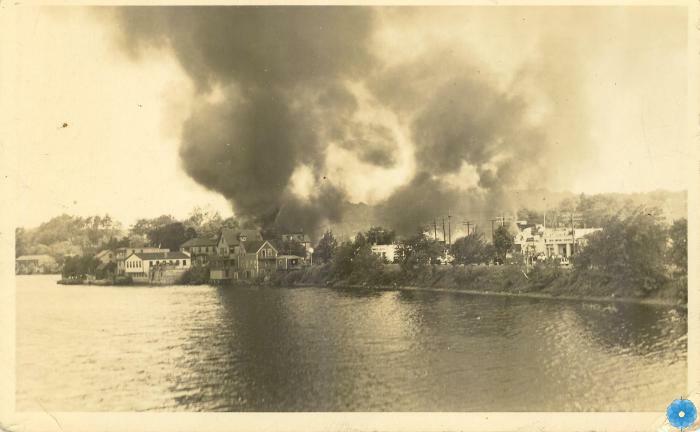 Subject: Bridgewater, Fires, Other, LaHave Street, Industry, Lumbering, Telfer Crowe Woodworkers Ltd. Narrative: The Telfer Brothers woodworking business was started in Caledonia, N.S. in 1899 by brothers Robie F. and Edward K. Telfer, who had bought out a small woodworking plant in the village. The work they did ranged from ships to houses, churches and banks. In March 12, 1907 the Telfer woodworking plant was established on the east side of the LaHave River by the Telfer Brothers of Caledonia, with support from the businessmen in Bridgewater. Edward's share of the business was bought out by Leonard C. Telfer, Robie's son. By August the main building for the factory, plus drying house was finished. The plant was immediately busy taking orders for heavy oak doors and window sashes. In 1918 tragedy struck when Leonard Telfer died of influenza. Soon after the company ran into financial difficulties. In 1920, Telfer Woodworking was sold to Crowe Furniture owned C. Noble Crowe and Fred Murray, but it was not successful. In 1922, Crowe brought Robie Telfer back into the business and the name became Telfer-Crowe Woodworkers, with Robie as general manager until he retired in 1935. In 1935, they were running the plant full time, employing 120 men in jobs ranging from cutting logs, hauling them to the mill, and using the lumber in manufacturing. C.N. Crowe died in February 1941. On July 28, 1941 a devastating fire broke out at the plant and destroyed the main factory along with the office building. A week later company manager Harold Brady said they would rebuild. By year end, Brady had purchased what was left of the Telfer-Crowe Woodworkers and began a new company called Brady's Lumber. Description: Black and white postcard looking across the LaHave River to Bridgewater's east side. Buildings along the river bank and lots of smoke billowing up from a large fire at the Telfer Crowe Woodworking Plant on LaHave Street. History of Use: Taken to document fire.